A 'free Metropass' policy was introduced by the City of Toronto late last year, which will require condo developers to provide complimentary one-year Metropasses to eligible purchasers of new condos. This new rule is intended to promote the use of public transit and will apply to development applications made after April 28, 2010 on buildings with 20 or more units, in designated areas around the downtown core as well as city centres in Scarborough, North York and Etobicoke. If you're considering a future condo purchase, a review of the designated 'free Metropass' areas may be useful in helping you determine some locations to consider for your next investment. 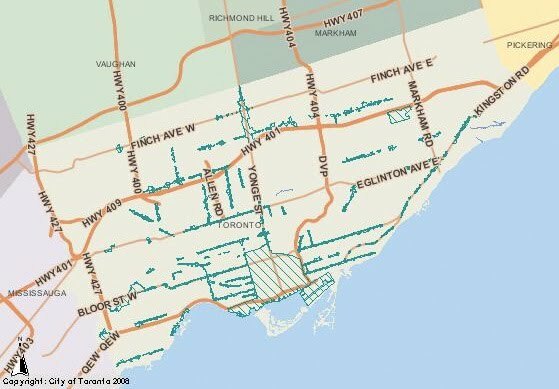 To learn more, you can visit the City of Toronto website, where you'll find a map outlining the designated growth areas (below in green) for which purchasers of new condo units will receive a free one-year Metropass. You can also search the site by address to determine whether the condo development you're considering is located in the area eligible for a free Metropass.